বনৰীয়া ম'হ (ইংৰাজী: Asiatic water buffalo, বৈজ্ঞানিক নাম-Bubalus arnee)এটা ডাঙৰ আকাৰৰ ম'হৰ প্ৰজাতি৷ ই সমগ্ৰ দক্ষিণ-পূব এছিয়াত স্থানীয় প্ৰজাতি৷ আই.ইউ.চি. এনৰ ৰঙা তালিকাত এই প্ৰাণীবিধক সংকটগ্ৰস্ত ( endangered species)বুলি স্বীকৃতি দিয়া হৈছে৷ বৰ্তমান ইয়াৰ জনসংখ্যা ৪,০০০ তকৈও কম বুলি ধাৰণা কৰা হৈছে৷  সমগ্ৰ বিশ্বত ইয়াৰ প্ৰায় ৩,৪০০ টা প্ৰাণী জীয়াই আছেগৈ৷ তাৰে ৩,১০০ (৯১%) ভাৰতবৰ্ষত বিশেষকৈ অসমত আছে৷. ↑ 1.0 1.1 1.2 1.3 1.4 1.5 1.6 Hedges, S., Baral, H. S., Timmins, R. J., Duckworth, J. W. (2008). "Bubalus arnee". IUCN Red List of Threatened Species. Version 2012.2. International Union for Conservation of Nature. http://www.iucnredlist.org/apps/redlist/details/3129. ↑ 2.0 2.1 2.2 2.3 Choudhury, A. (2010). The vanishing herds : the wild water buffalo. Gibbon Books, Rhino Foundation, CEPF & COA, Taiwan, Guwahati, India. ↑ Ellerman, J. R., Morrison-Scott, T. C. S. (1966). Checklist of Palaearctic and Indian mammals 1758 to 1946. Second edition. London: British Museum of Natural History. Pp 383–384. ↑ Gentry, A. Clutton-Brock, J., Groves, C. P. (2004). The naming of wild animal species and their domestic derivatives. Journal of Archaeological Science 31: 645–651. ↑ Yang, D. Y., Li Liu, Chen, X., Speller, C. F. (2008). 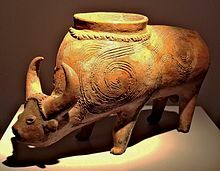 Wild or domesticated: DNA analysis of ancient water buffalo remains from north China. Journal of Archaeological Science 35 (2008): 2778–2785. ↑ Choudhury, A. (1994). The decline of the wild water buffalo in northeast India. Oryx 28(1): 70–73. ↑ Heinen, J. T. (1993). 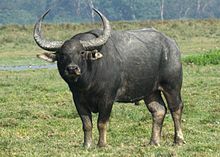 Population viability and management recommendations for wild water buffalo (Bubalus bubalis) in Kosi Tappu Wildlife Reserve, Nepal. Biological Conservation 65: 29–34. ↑ Heinen, J. T., Ramchandra, K. (2006). Threats to a small population: a census and conservation recommendations for wild buffalo Bubalus arnee in Nepal. Oryx 40: 1–8. ↑ Chaiyarat, R., Lauhachinda, V., Kutintara, U., Bhumpakphan, N., Prayurasiddhi, T. (2004). Population of Wild Water Buffalo (Bubalus Bubalis) in Huai Kha Khaeng Wildlife Sanctuary, Thailand. Natural History Bulletin Siam Society 52 (2): 151–162.